There are bears where I live. 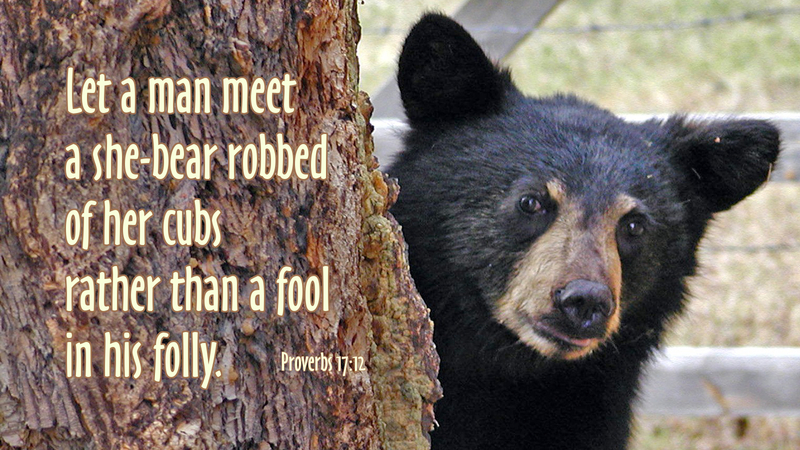 Thankfully, I’ve never met a “she-bear robbed of cubs.” Yet fools bent on folly are numerous, even in the church. So, remember, while you’re pointing a finger at somebody else, three fingers are pointing back at you. It’s hard to escape the effects of sin. We want to call Jesus our brother, but we want to live our lives our way. Still, there is hope in our foolish world. Because sin has been dealt with by Jesus, his family are those who do the will of his Father. So when you point to Jesus, your Savior, those other three fingers remind you of what Micah says about God’s desire for you: (1) act justly, (2) love mercy (3) walk humbly with God (Mic 6:8). Even a fool like me can learn from that. Prayer: Gracious Father, keep my eyes focused on your cross whose glorious light continues to shine and lead me through the foolish darkness of my world. Amen.